Lemongrass (Cymbopogon citratus), sometimes called lemon grass or citronella, is a tall grass-like ingredient commonly used in Southeast Asian cooking. The lower stalks and bulbs of the plant have a fresh, clean, lemony scent that is sometimes also added to teas, marinades, curries, and broths. In addition to its use as a flavoring agent, lemongrass and lemongrass essential oil are also used for medicinal purposes, some of which are supported by scientific evidence. When used medicinally, lemongrass may be taken by mouth, rubbed on the skin, or inhaled as an aromatherapy treatment. Applied to the skin, lemongrass or lemongrass oil is used to treat a headache and musculoskeletal pain. As an aromatherapy treatment, lemongrass oil extract may be inhaled to treat muscle pain, infections, cold, or flu symptoms. While animal studies and very limited lab studies have supported some of these lemongrass uses, human evidence is lacking to support these wide-ranging medicinal benefits. There are a few studies, however, that support certain limited lemongrass benefits. Preliminary research has suggested that lemongrass oil added to a hair tonic may be able to reduce dandruff. More studies are needed to confirm this benefit. 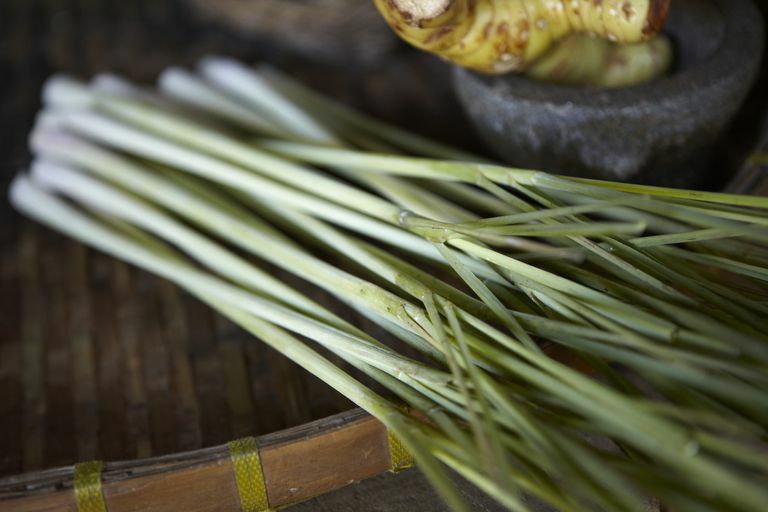 And a small study found that using a lemongrass infusion was more effective at reducing symptoms of thrush in HIV/AIDS patients than more commonly used topical solutions. One tablespoon of fresh lemongrass provides about five calories, most of which come from carbohydrate (fiber) and protein according to USDA data. Minerals in lemongrass include calcium (3 mg), potassium (34 mg), manganese (0.2 mg), magnesium (2.9 mg), and iron (0.4 mg). Lemongrass also provides certain vitamins (in very small amounts) including, vitamin A, vitamin C, folate, and niacin. However, consuming lemongrass won't have a significant impact on your daily vitamin needs. Keep in mind that lemongrass flavored oil provides significantly more calories because it is usually a combination of a cooking oil (like canola oil) and lemongrass extract. For example, one popular brand of lemongrass flavored spray on oil provides 40 calories per serving (1 teaspoon) and 4.5 grams of fat. Lemongrass is getting easier to find in grocery stores, although in some areas of the country you may need to go to a specialty Asian market to find it. When choosing lemongrass, look for firm green stalks with healthy looking bulbs attached. Some stores may sell lemongrass with much of the tops removed. For most uses, this is fine. Most recipes require that you use the bottom of the stalk or the bulb. To use lemongrass in teas, soups, broth, or other liquids, crush the bottom area of the stalks to release the aromatic oil. Then, immerse the pieces in the liquid so that aromatic oils are released. Remove the stalks before eating or drinking the beverage. In other recipes, you may need to chop or mince the bulb or lower area of the stalks before adding to a curry, salad, marinade, or stir-fry. Lemongrass is likely safe for most people when consumed in typical amounts found in food. However, there may be some concerns when using it for medicinal purposes. Used topically, lemongrass may cause skin irritation. Additionally, consuming high amounts of lemongrass may cause dizziness, drowsiness, dry mouth, excess urination, and increased appetite. Lemongrass essential oil in high amounts can damage liver and stomach mucous membranes, according to Memorial Sloan Kettering Cancer Center, and excessive intake of lemongrass tea may also affect kidney function. The medical center also cautions that pregnant women should avoid lemongrass because certain ingredients in lemongrass caused birth defects in rats when consumed in large amounts. Additionally, people undergoing chemotherapy should avoid lemongrass because it may interfere with the actions of some chemotherapeutic agents. Yes, lemongrass can be wrapped in plastic and refrigerated for two to three weeks or frozen for up to six months. ﻿What is a suitable lemongrass substitute in recipes? The best (and easiest-to-find) substitute for lemon grass is lemon zest. Lemongrass Full Monograph. Natural Medicines Comprehensive Database. 08/15/2018. Lemongrass. Memorial Sloan Kettering Cancer Center. About Herbs, Botanicals, and Other Products. Chaisripipat W, Lourith N, Kanlayavattanakul M. Anti-dandruff hair tonic containing lemongrass (Cymbopogon flexuosus) oil. Forsch Komplementmed 2015;22(4):226-9. DOI: 10.1159/000432407. Wright, S. C., Maree, J. E., and Sibanyoni, M. Treatment of oral thrush in HIV/AIDS patients with lemon juice and lemon grass (Cymbopogon citratus) and gentian violet. Phytomedicine 2009;16(2-3):118-124. DOI: 10.1016/j.phymed.2008.07.015. Will Adding Marjoram to Pizza Make It Healthier?